What you eat matters more than how much you eat. Discover why in this revolutionary nutrition guide to clean eating, exercise, and an anti-inflammatory diet that can enhance your wellness and quality of life. There is a diet and exercise plan that covers all the bases—food we should eat and food that tastes good; what is best for our bodies and what is easily doable in the real world—all while offering hunger-free weight loss. Developed by Andrew Larson, M.D. and certified Heath Fitness Specialist Ivy Larson, Clean Cuisine is scientifically proven to reverse diabetes, improve cholesterol and blood pressure, and ease the symptoms of other inflammatory diseases such as multiple sclerosis, fibromyalgia, asthma, allergies, and arthritis. Broken down into eight easy steps and spread over the course of eight weeks, Clean Cuisine will enable readers to transform their bodies one delicious meal at a time by adopting an anti-inflammatory diet and choosing unrefined foods in their most natural, whole state. With guilt-free, delicious recipes and a workout program that has been proven to deliver substantial results with just three 30-minute sessions a week, Clean Cuisine is the long-term answer to eating for optimal health, disease prevention, weight loss, vitality, longevity, and good taste. Ivy Larson is an American College of Sports Medicine certified health fitness specialist, bestselling author, TV personality, recipe developer, and “Clean Cuisine” cooking instructor. Ivy currently lives in North Palm Beach with Andy and their son. 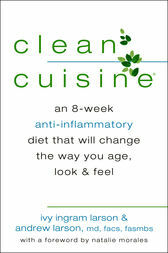 Visit Clean Cuisine online at www.cleancuisine.com; facebook.com/cleancuisineandmore; and twitter.com/clean_cuisine. Andrew Larson, MD, FACS, FASMBS, is a board-certified general, laparoscopic, and bariatric surgeon, one of only a few hundred physicians in the world currently directing an internationally certified “Center of Excellence” program offering weight loss surgery. A graduate of the University of Pennsylvania School of Medicine, he serves as part of the affiliate faculty of the University of Miami Miller School of Medicine as an assistant professor of surgery at the JFK Medical Center and is also an affiliate clinical assistant professor at the Schmidt College of Biomedical Science at Florida Atlantic University. Dr. Larson presently works in Palm Beach County, Florida, where he serves as medical director for JFK Medical Center’s Bariatric Wellness and Surgical Institute and as president of the Palm Beach County Medical Society.